“Leverage” is not a flavor of the week marketing term. In ancient times, Archimedes said: “Give me a long enough lever and a solid enough place to stand, and I could move the world.” I can’t give you an action plan to move the world, but I will describe a few of the rich marketing opportunities for independents that are now lying out there in plain sight. By putting the proven principles of evidence-based advertising to work, you will be able to leverage media in a way that will revitalize your market share like nothing else can. Every week two or three Big Boxes run a full color, multi-page flyer claiming huge price reductions. They back this up with a massive TV presence. They often run flashy mailers. They have big selections, special credit offers, and well-trained, aggressive sales people. They are open more hours than he can duplicate. I must admit that the situation looked pretty hopeless, at least the way he had framed the problem. But, perhaps the circumstances could be reframed in a less menacing way. Were there any advantages he had that the Big Boxes could not duplicate? Were there any vulnerabilities in their mass-produced marketing? [Radio, for example, is hopelessly fragmented in large markets, but is often reasonably effective in more rural areas]. Were there any media he could use that they were ignoring? Was he possibly losing market share because he was being intimidated and was frozen in the headlights? Was he training his customers to ignore him and make the drive to the big city to shop? When you reframe a problem, sometimes miracles can happen. Who's Afraid of the Manassas Mauler? During the Roaring Twenties, Jack Dempsey was the heavyweight boxing champion of the world. He, too, was considered virtually invincible. Called the Manassas Mauler after his hometown in Colorado, he fought with ferocious energy, intimidating and defeating all opposition. Along came a challenger named Gene Tunney. Tunney was a scientific boxer who had studied films of Dempsey’s fights for years. Tunney determined that Dempsey had a weakness that he believed he could exploit and use to defeat the champion. Dempsey had a devastating left hook. However, Tunney noted that just before Dempsey threw the left hook he lowered his left hand slightly, exposing his own jaw. Tunney became convinced that in that split second of exposure he could throw his own right and beat the champion to the punch. Repeatedly, Tunney visualized the right hand counterpunch in his mind. Finally, Tunney got his opportunity to fight Dempsey and he was positive he could win. But a month before the fight, he made a serious mistake. He began reading the sports pages of six major newspapers. Almost no one believed Tunney had a chance. All the leading sportswriters picked Dempsey by a knockout. WHO’S AFRAID OF THE BIG BOXES? 1. The full color flyers produced by Big Boxes are look-alike, price-item productions that are produced in haste and virtually devoid of a persuasive story and consumer benefits. A well-designed and crafted flyer or even an ROP ad produced locally can produce much better results. 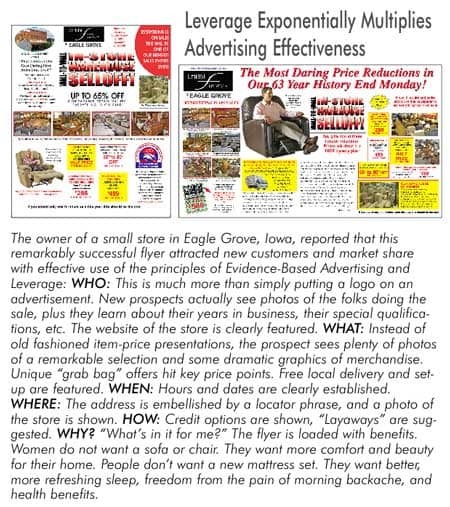 (More and more newspapers are making this flyer service available). See the exhibit for more information about features you can show in your ads that Big Boxes can’t, or won’t. 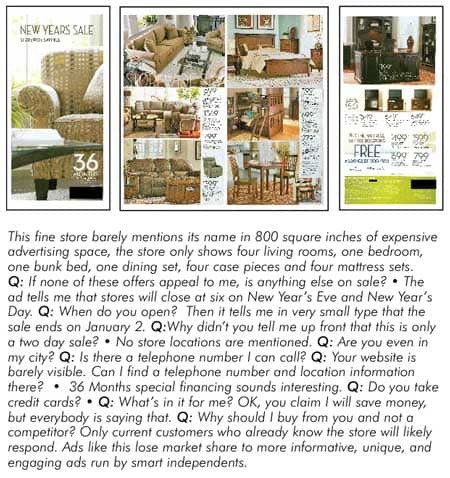 Also see the Furniture World article “Evidence-Based Advertising” posted to furninfo.com at http://bitly.com/tkHF8V. 2. The TV commercials and websites used by Big Boxes lack local color and personality. This is especially true of their websites. Like their print media, they are sterile corporate products and have very little relation to the managers and owners of their local stores. Nearly all Big Box corporate websites have the same look for their landing page. There is usually a tab that says “About Us,” with a long and tedious written document that no one reads. There should be a greeting video with the owner speaking directly to the individual prospect. Google loves content and video. Most independents have developed websites by now. But the tragedy is they rarely even look at them, let alone keep them updated and fresh. Make sure you create a personal greeting video and continuously update your content with your latest ads. This service should not be very expensive. One independent I know in Minnesota had a well-scripted video done for his website by the local TV station. It was then professionally edited with additional graphics for a total cost of about $300.(www.furnitureandmattresses4less.com). Hosting, and posting your ads on your website on a regular basis should be very reasonable in cost. Above all, monitor your website every week, minimum. A powerful website is a selling tool with immense ROI. The website potential is too often misused, underused, and poorly used by independents (and Big Boxes). 3. Mailings need not be fancy and expensive. Kingsley Furniture of Kingsley, Iowa made an appeal to a small rural market that was contained in a simple letter, black with one color. It stood out from the crowd because of its unique simplicity, persuasive copy, and interesting story. The mailing broke sales records. Sheri Smith of Ocala, Florida used a basic postcard to launch a successful G.O.B. event. In both cases the products were custom-designed to their needs by a mailing service. 5. Don’t train your customers to shop the big city. People generally buy furniture as couples. They shop together. Many small independents close every weekday night at five or six. Then they are open a limited time on Saturday, and often close on Sunday. (Sometimes a Sunday closing is due to a sincere religious belief, which is certainly understandable. Too often, however, Sunday closings are simply a convention or a convenience.) Everyone needs a day off, of course. But, if there is no religious issue about Sunday, why not take off Monday? Why train shoppers to drive to the Big Boxes every Sunday when, for some people, it is the only day the family can shop together? Sunday will usually produce more business per hour than any other day of the week. At the very least, be open at least two evenings a week. The retailing of home furnishings has never been easy. Moreover, like every other industry these days, the rate of change is ferocious. And, regardless of our roles, those of us who count our time in the industry in decades rather than in years have never seen more difficult times. First big screen TVs took precedence over furniture, mattresses and new carpet. Then the housing market collapsed and a brutal general recession ensued. Those furniture chains and independents that are still standing can be proud. Even as things begin to recover, survivors know that they must keep learning and improving to continue to survive. No one has all the answers. Thomas Edison once said: “We don’t know one-millionth of one percent about anything.” However, the take home message here is that–even in the face of furious change–the principles of selling at retail remain the same. My first mentor, Clyde Bedell tirelessly insisted on principles that remain forever true: “All good selling is serving. People buy only to get benefits. The prevailing motivation of the prospective customer remains: ‘What’s in it for me? Why should I buy from you and not your competitor?’” The great home furnishings retailers of the future, large and small, will succeed for the same reasons as those of the past survived and flourished. They will be those who can tirelessly define their answers to these questions and tell about their USP with unique and compelling stories. Having a bedrock of wanted products and impressive core skills are necessary, but not fully adequate elements of success. What is also needed is the ability to express through media and through your associates how these products and skills can improve and enrich the lives of your customers and their families. Note: Passages about Gene Tunney and his defeat of Jack Dempsey were taken from The MetaValues Breakthrough, by Larry Mullins. Larry Mullins is a contributing editor for Furniture World and has 30+ years of experience on the front lines of furniture marketing. Larry’s mainstream executive experience, his creative work with promotion specialists, and mastery of advertising principles have established him as one of the foremost experts in furniture marketing. His affordable High-Impact programs produce legendary results for everything from cash raising events to profitable exit strategies. His newest books, THE METAVALUES BREAKTHROUGH and IMMATURE PEOPLE WITH POWER… How to Handle Them have recently been released by Morgan James Publishing. Joe Girard, “The World’s Greatest Salesman” said of this book: “If I had read Larry Mullins’ book when I started out, I would have reached the top much sooner than I did.” Larry is founder and CEO of UltraSales, Inc. and can be reached directly at 904.794.9212 or at Larry@LarryMullins.com. See more articles by Larry at www.furninfo.com or www.ultrasales.com.